A fitting showcase for leading stars Steven McRae and Natalie Osipova, Rhapsody is a dreamy contemplation on the pleasure of dance. 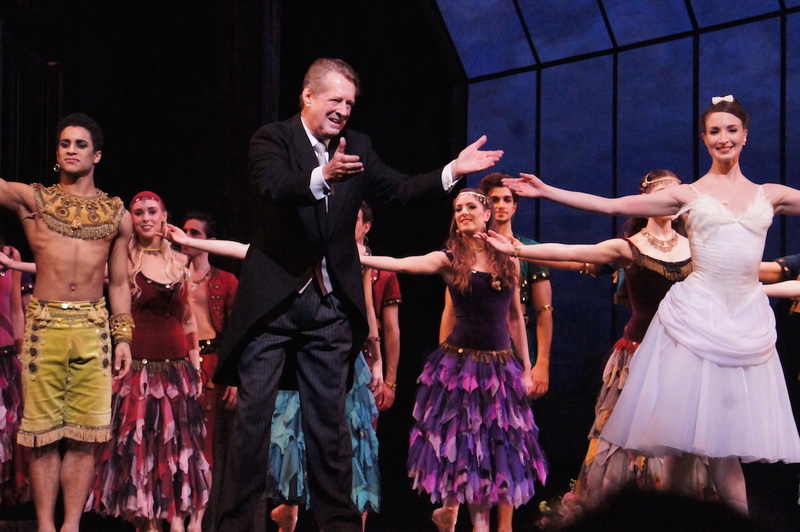 Created by Ashton in 1980 for Mikhail Baryshnikov, the piece is focused more on the male principal dancer, who begins on stage and ends exalted in a grand lift by the men. Rhapsody has the spontaneous delight of an abstract work; the dance just seems to organically suggest itself from the splendour of Rachmaninoff’s music. Excellent playing from Orchestra of the Royal Opera House is enhanced here by solo piano from Robert Clark. 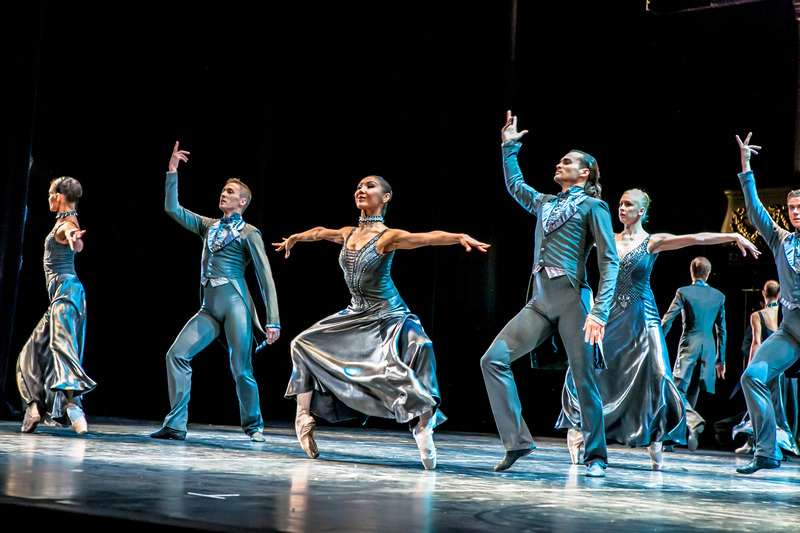 In a starkly simple setting, designed by Ashton himself, we first find McRae as a golden statue, with female corps de ballet as frozen spectators. 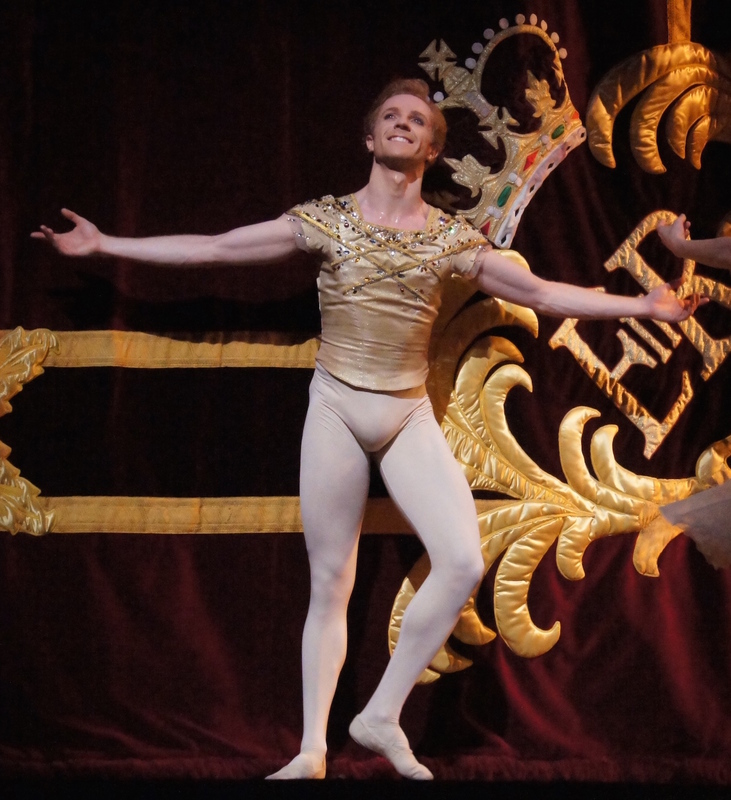 Male dancers wear cream tights and gold top adorned with metallic gold trim. Female dancers complement this in filmy pale pink skirts over a cream underlay, with silver metallic trim on the bodice. Six female and six male dancers are given plenty of exposure, with many individual featured moments. Sitting dead centre provides the chance to appreciate the symmetrical elements to the choreography. In peak form, McRae exhibits his dual signature strengths of lightning speed and a bold attitude. As well as fluid movement, the ballet calls for many snappy poses, and McRae strikes these with his unique edge of quirky, commanding expression. A series of pirouettes coming forward are completed at an incredible pace. Making a delayed entrance, Osipova begins initially well upstage before on to sweep across the entire massive space. Working with nimble swiftness and a highly muscular sense of accuracy, Osipova performs the most challenging of steps, all with a serene smile on her face. 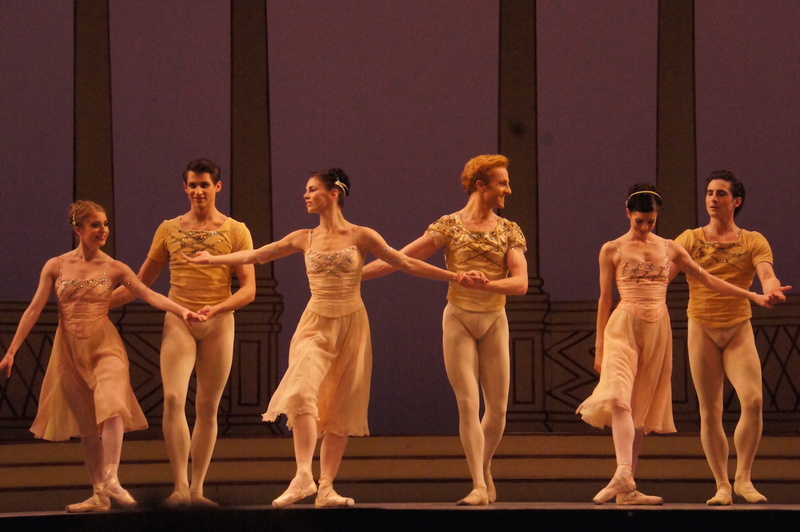 Ashton makes us wait for a pas de deux, then certainly does not disappoint. 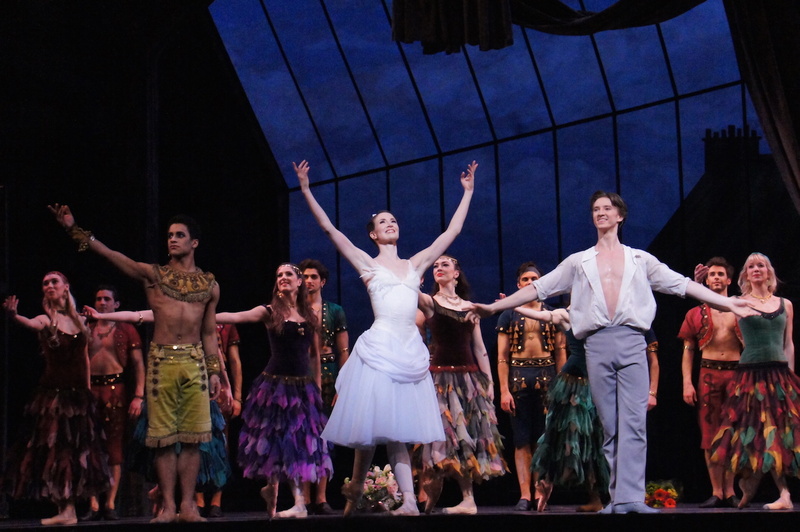 The music surges to a climax as McRae and Osipova perform a grand sequence that is tinged with heartfelt longing. While the title The Two Pigeons might seem to metaphorically refer to The Young Girl and The Young Man, Ashton’s 1961 work actually features two live pigeons on stage. Presented in two acts, The Two Pigeons has the scope of a full-length ballet without any of the excess of divertissements or subplots. The sincere Young Man attempts to paint a portrait of the restless Young Woman but she continually breaks into flirty dance moves. Ashton ramps up the interest in the first act, beginning with the pair of protagonists before adding a bevy of female friends, in dusky tones of pink and mauve, then a camp gaggle of shirtless male gypsies, wearing bolero jackets and knee-length shorts in vivid jewel tones. Tantalised by a Gypsy Girl, and frustrated with the Young Girl, the Young Man absconds with the gypsies, only to later realise his heart belongs with his initial love. The moving final image of the reconciled pair is set off beautifully as a pigeon flies on stage to join its partner. In contrast with simple design of Rhapsody, Jacques Dupont’s setting for The Two Pigeons is a grander affair, featuring a spacious loft overlooking the chimneys of Paris and, later, a mysterious gypsy camp. Lauren Cuthbertson is a magnetic delight as the Young Girl, so adorable that her Young Man seems terribly petulant to be annoyed with her fidgeting. 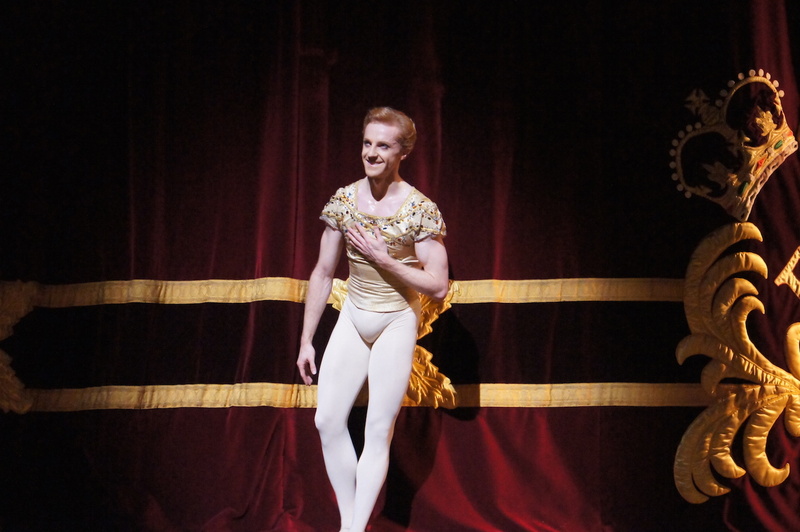 Cuthbertson dances the role with perky freshness, moving with effortless lightness and grace. A terrific actress as well, Cuthbertson amuses as she mocks the dancing of the Gypsy Girl and captures hearts with the sympathetic regrets of the Girl. Vadim Muntagirov gives a noble reading of the mirthless Young Man, making his final humility all the more affecting. Ashton’s pas de deux work for the pair is high on storytelling, featuring grounded, characterful work rather than the grand leaps and poses of fairytale ballets. Muntagirov and Cuthbertson perform this work brilliantly, conveying the aspects of the story as clearly as if they were in a play. With scores of female and male gypsies on stage, act two features extended full company work that is deceptively simple yet completely dazzling to watch. 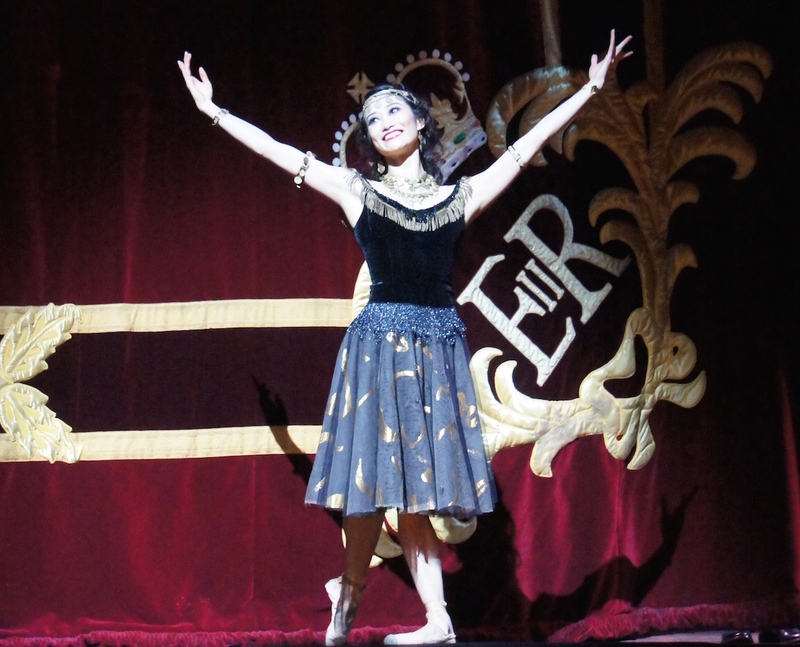 Fumi Kaneko conveys the exotic mysticism of the Gypsy Girl with a dazzling exhibition of dance. 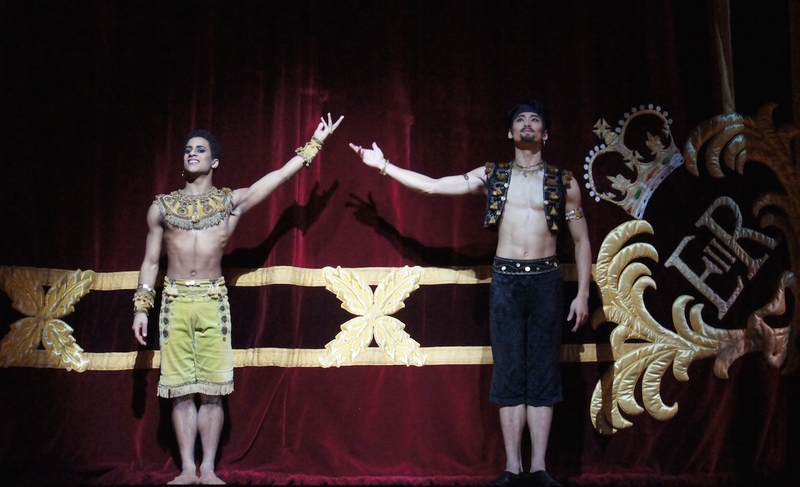 Ryoichi Hirano has a commanding presence as the Gypsy Girl’s possessive Lover. Marcelino Sambé dances the Gypsy Boy with a mischievous sparkle in his eye. Maestro Barry Wordsworth leads a grand performance of André Messager’s score. 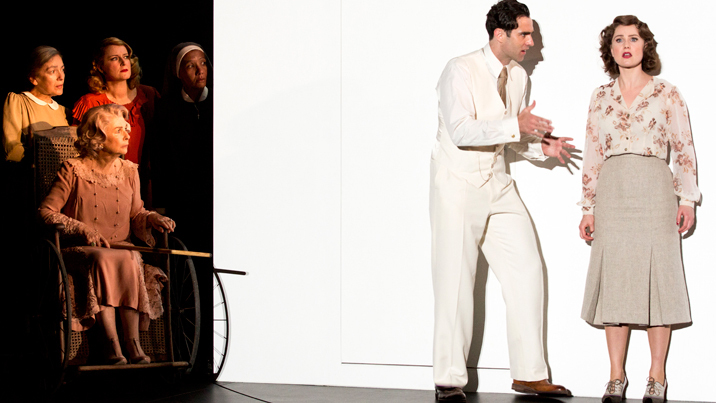 Rhapsody / The Two Pigeons plays selected dates at Royal Opera House, Covent Garden until 30 January 2016. 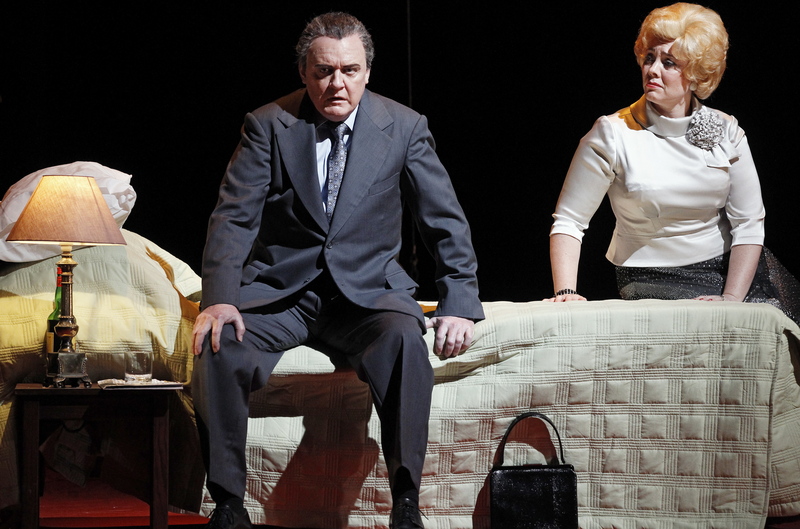 It will be broadcast to cinemas as part of the ROH Live Cinema Season on 26 January 2016. 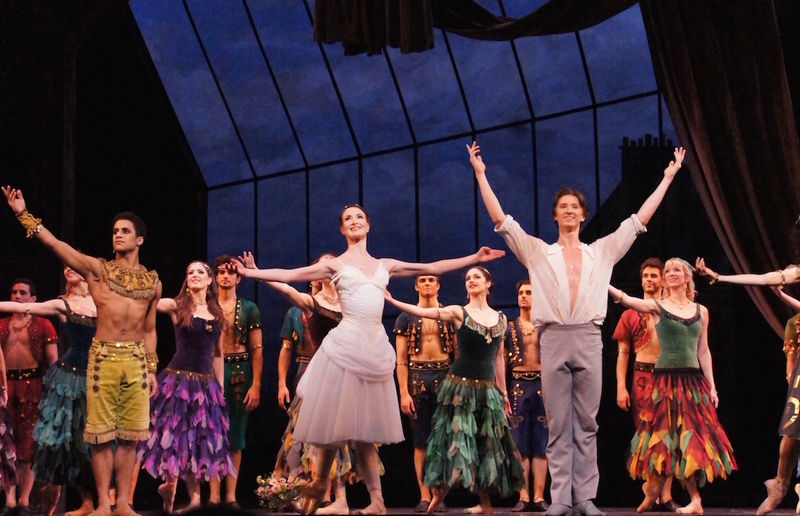 Rhapsody / The Two Pigeons was reviewed 2pm Saturday 23 January 2016.